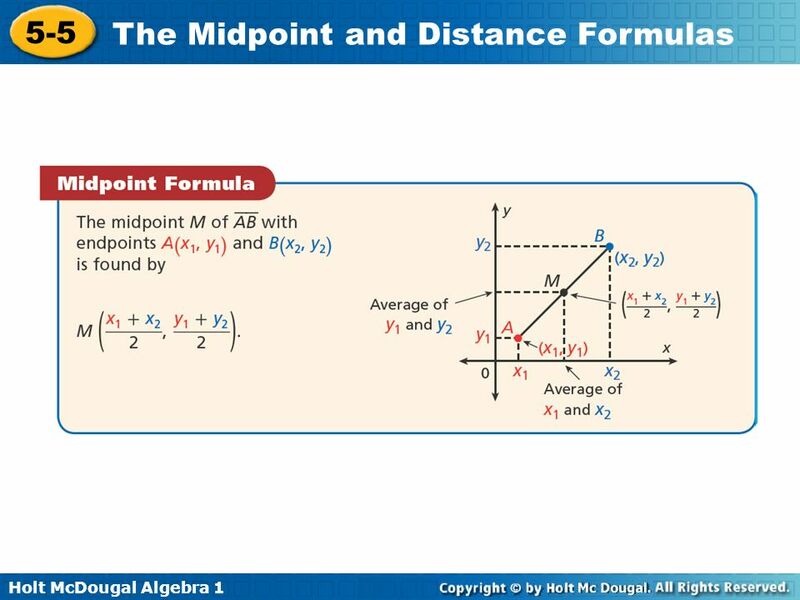 Objective Apply the formula for midpoint. 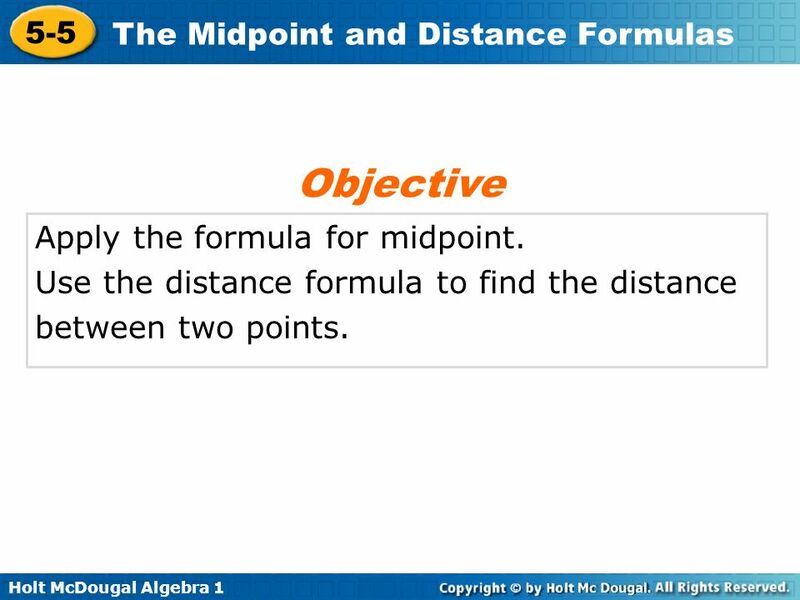 1 Objective Apply the formula for midpoint. 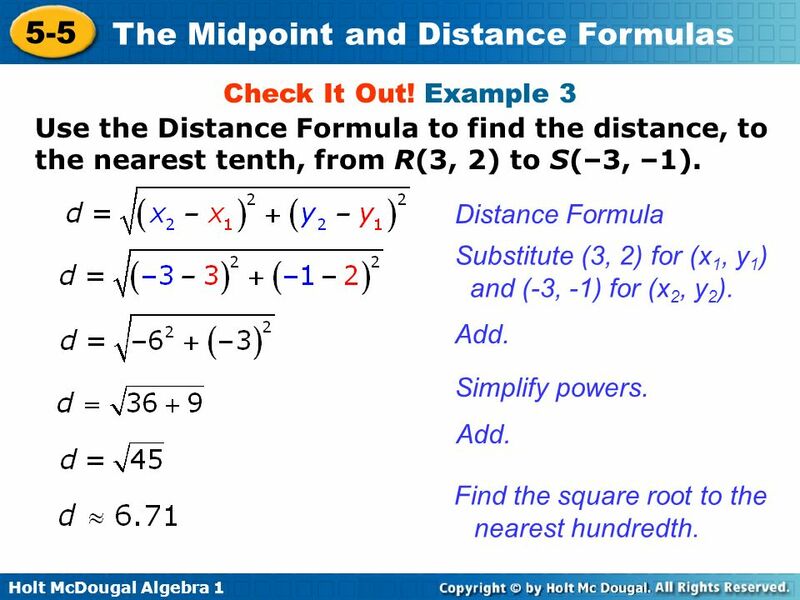 Use the distance formula to find the distance between two points. 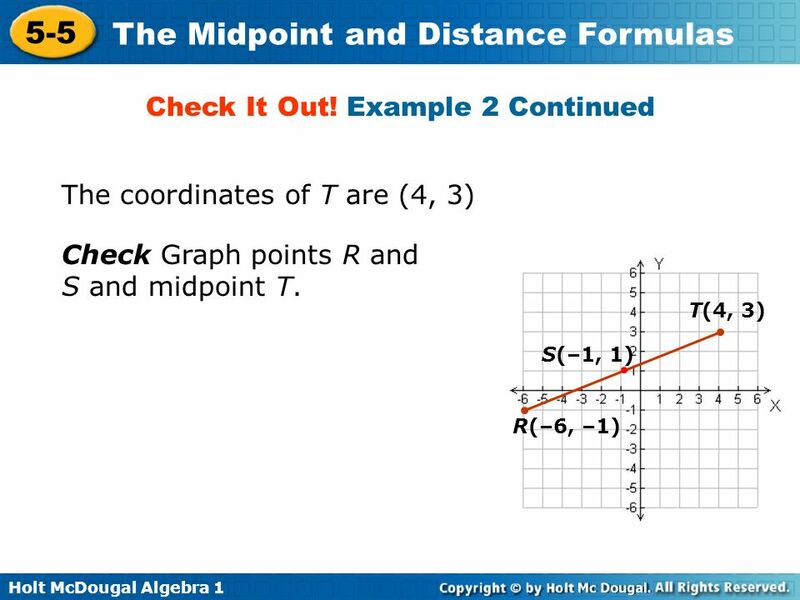 3 In Lesson 5-4, you used the coordinates of points to determine the slope of lines. 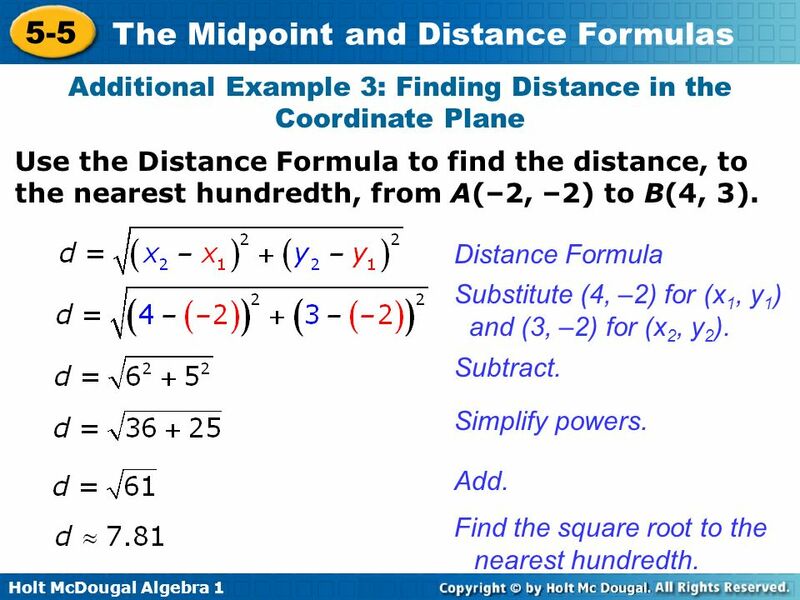 You can also use coordinates to determine the midpoint of a line segment on the coordinate plane. 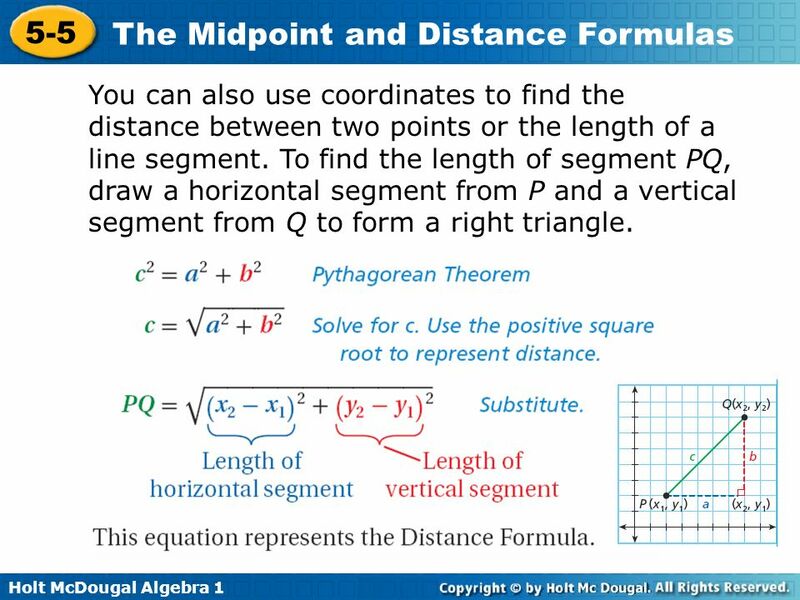 The midpoint of a line segment is the point that divides the segment into two congruent segments. Congruent segments are segments that have the same length. 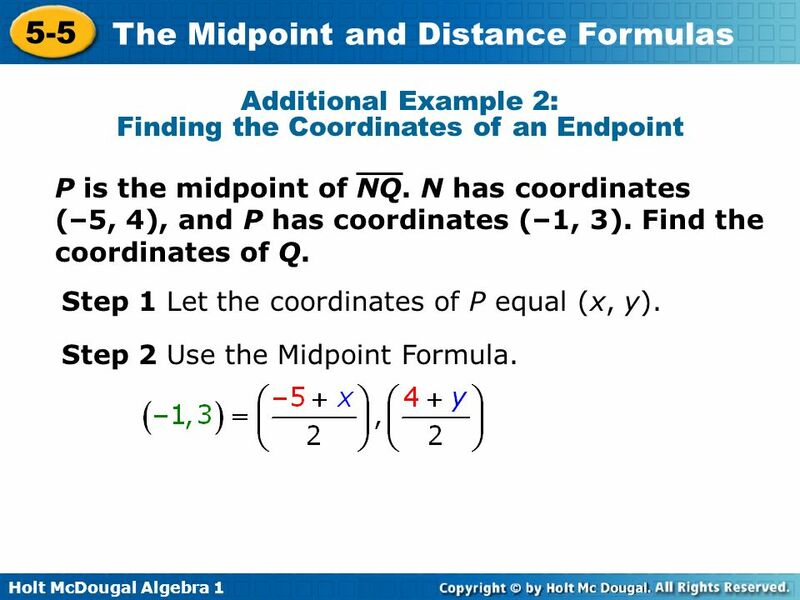 You can find the midpoint of a segment by using the coordinates of its endpoints. Calculate the average of the x-coordinates and the average of the y-coordinates of the endpoints. 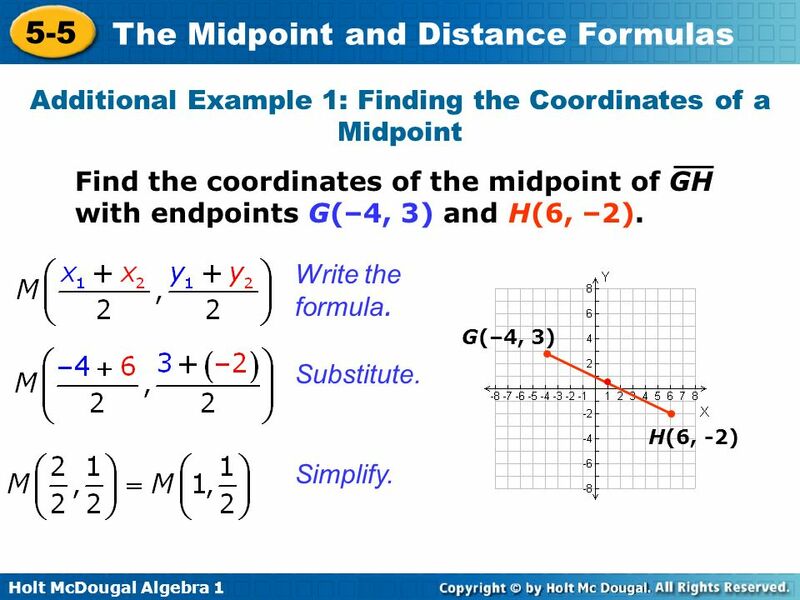 Find the coordinates of the midpoint of GH with endpoints G(–4, 3) and H(6, –2). Write the formula. G(–4, 3) Substitute. H(6, -2) Simplify. 6 Check It Out! 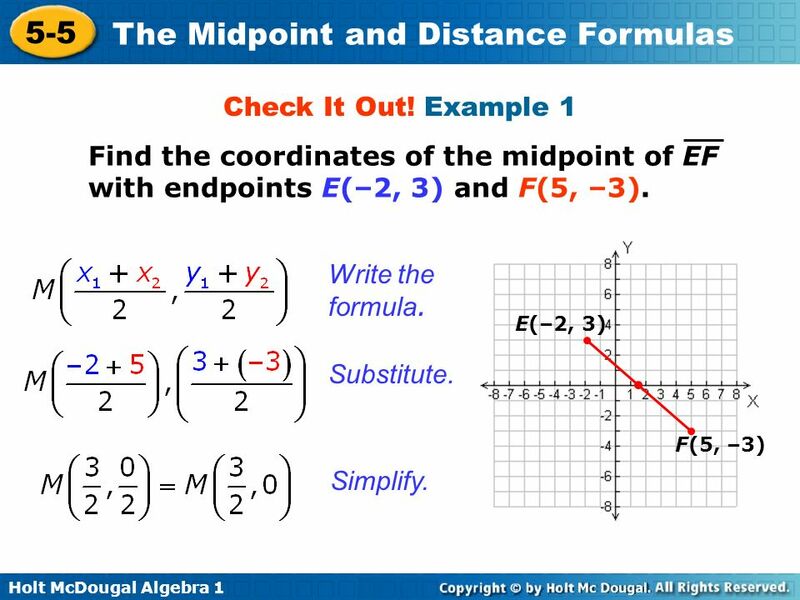 Example 1 Find the coordinates of the midpoint of EF with endpoints E(–2, 3) and F(5, –3). Write the formula. E(–2, 3) Substitute. F(5, –3) Simplify. P is the midpoint of NQ. N has coordinates (–5, 4), and P has coordinates (–1, 3). Find the coordinates of Q. Step 1 Let the coordinates of P equal (x, y). 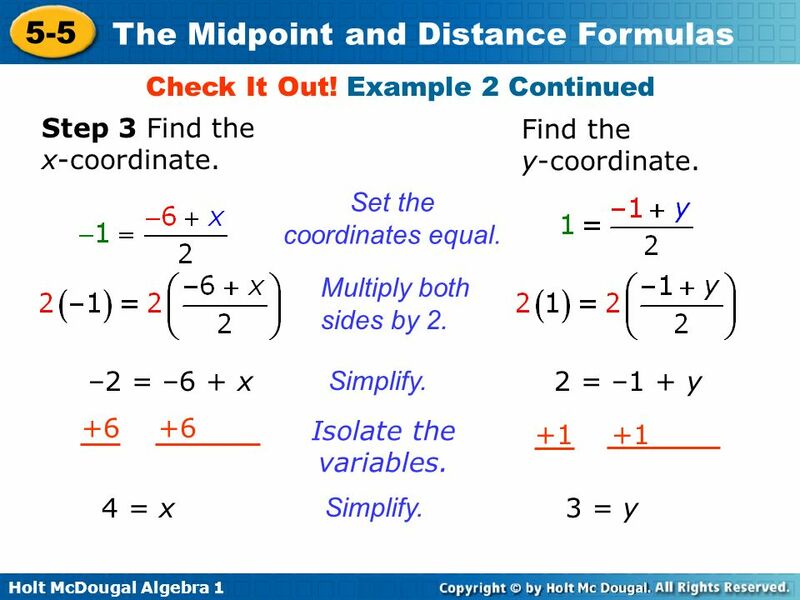 Step 2 Use the Midpoint Formula. 10 Check It Out! 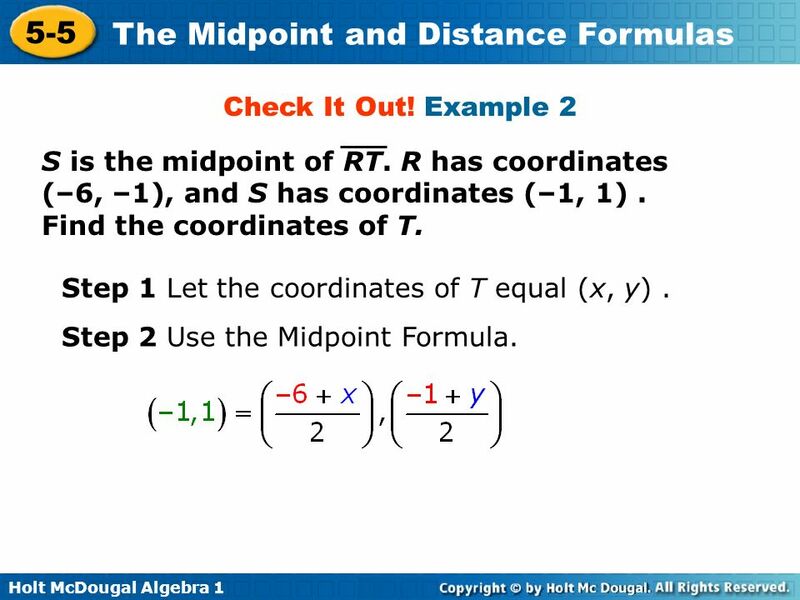 Example 2 S is the midpoint of RT. R has coordinates (–6, –1), and S has coordinates (–1, 1) . Find the coordinates of T. Step 1 Let the coordinates of T equal (x, y) . 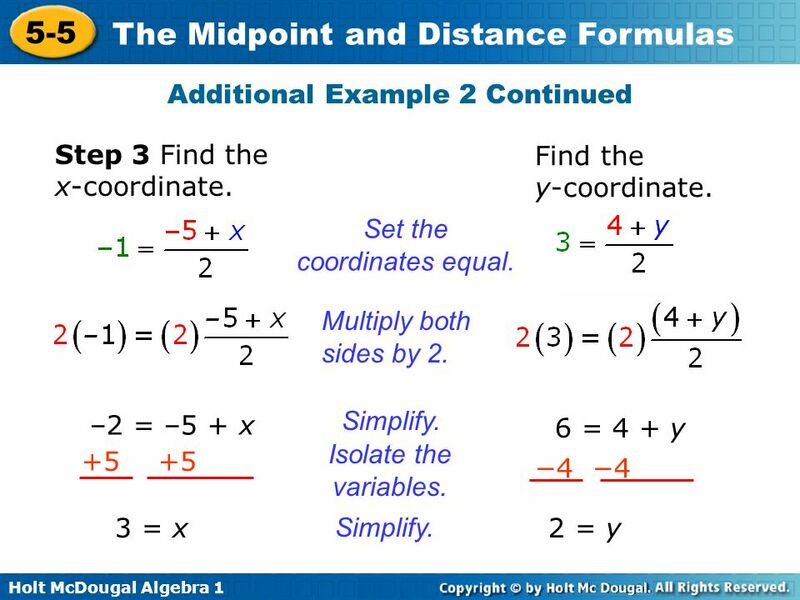 Step 2 Use the Midpoint Formula. 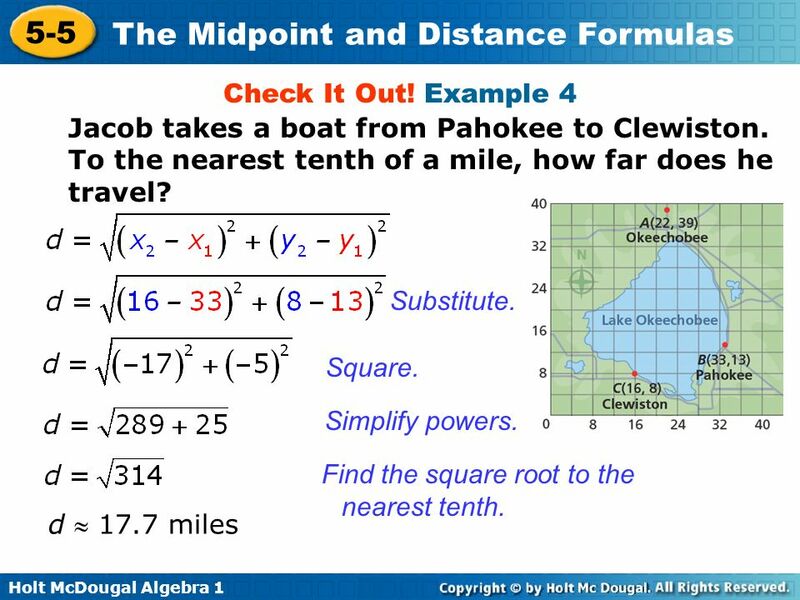 13 You can also use coordinates to find the distance between two points or the length of a line segment. To find the length of segment PQ, draw a horizontal segment from P and a vertical segment from Q to form a right triangle. 14 The Pythagorean Theorem states that if a right triangle has legs of lengths a and b and a hypotenuse of length c, then a2 + b2 = c2. Remember! 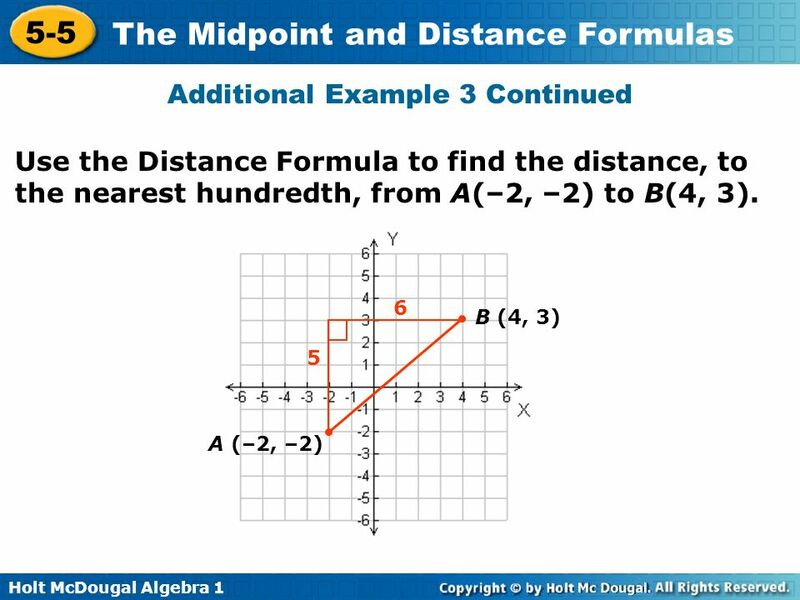 Use the Distance Formula to find the distance, to the nearest hundredth, from A(–2, –2) to B(4, 3). Distance Formula Substitute (4, –2) for (x1, y1) and (3, –2) for (x2, y2). Subtract. Simplify powers. Add. Find the square root to the nearest hundredth. 17 Check It Out! 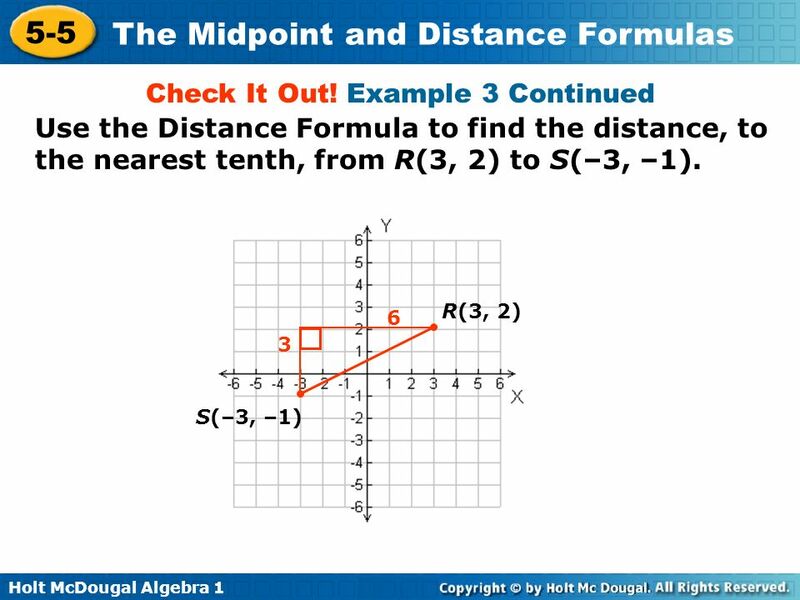 Example 3 Use the Distance Formula to find the distance, to the nearest tenth, from R(3, 2) to S(–3, –1). Distance Formula Substitute (3, 2) for (x1, y1) and (-3, -1) for (x2, y2). Add. Simplify powers. Add. Find the square root to the nearest hundredth. Each unit on the map represents 100 meters. 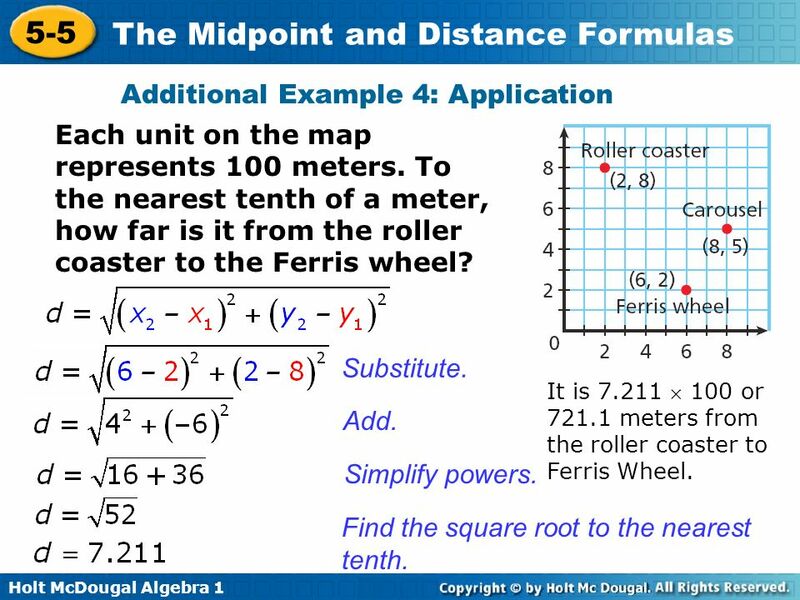 To the nearest tenth of a meter, how far is it from the roller coaster to the Ferris wheel? Substitute. It is  100 or meters from the roller coaster to Ferris Wheel. Add. Simplify powers. Find the square root to the nearest tenth. 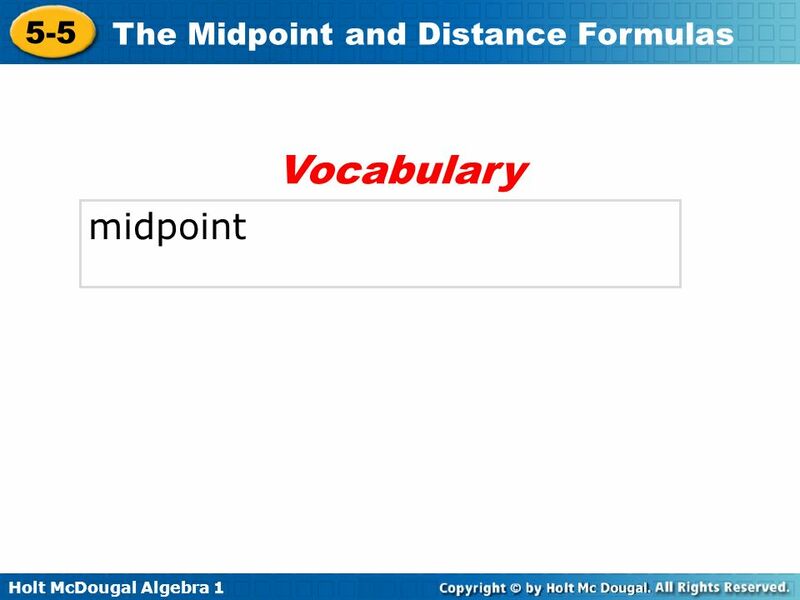 Download ppt "Objective Apply the formula for midpoint." Warm Up Lesson Presentation Lesson Quiz. Midpoints of line segments. Key concepts  Line continue infinitely in both directions, their length cannot be measured.  A Line Segment is a part of. Warm Up The area of a circle is square feet. Find the perimeter of the circle in inches A triangle’s sides are 24, 25 and 7. How long is the shortest. 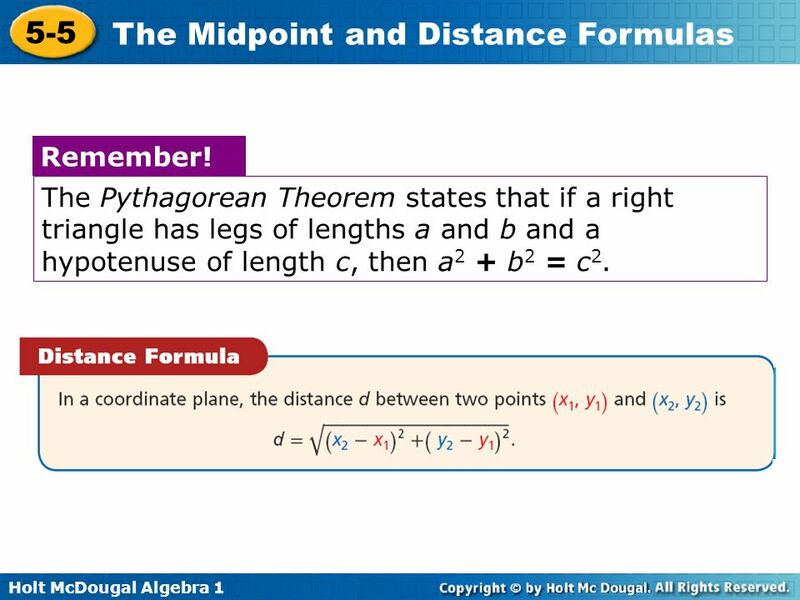 Pythagorean Theorem Please view this tutorial and answer the follow-up questions on loose leaf to turn in to your teacher. 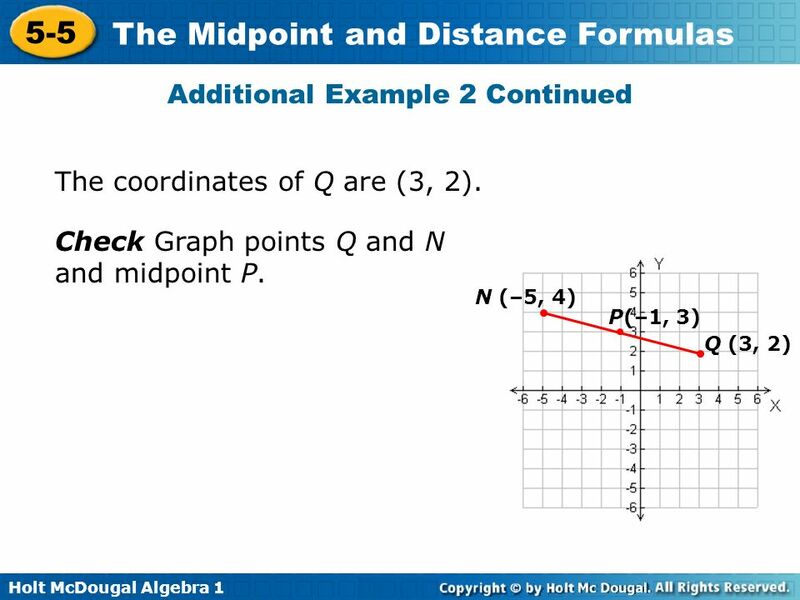 Section 1-6 The Coordinate Plane SPI 21E: determine the distance and midpoint when given the coordinates of two points Objectives: Find distance between. EXAMPLE 1 Find the length of a hypotenuse SOLUTION Find the length of the hypotenuse of the right triangle. (hypotenuse) 2 = (leg) 2 + (leg) 2 Pythagorean. Warm Up Problem of the Day Lesson Presentation Lesson Quizzes. 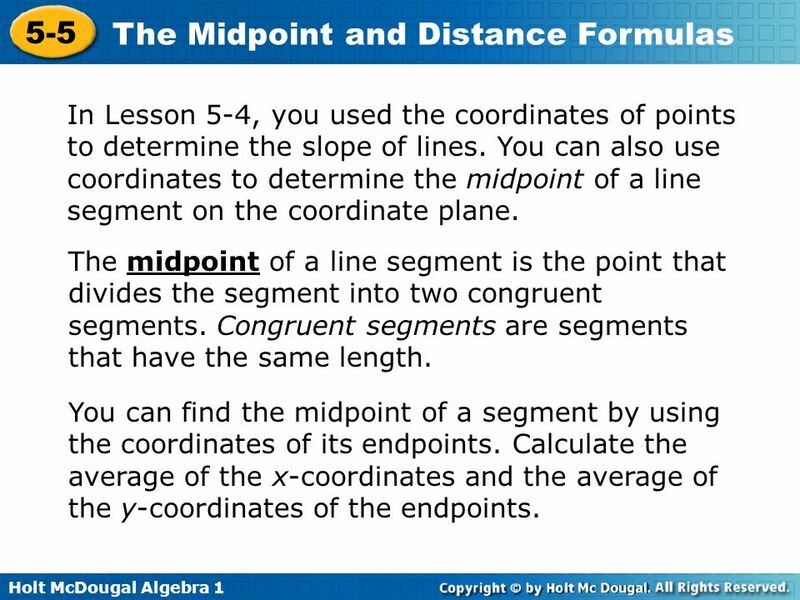 Geometry 1-6 Midpoint and Distance. Vocabulary Coordinate Plane- a plane divided into four regions by a horizontal line (x-axis) and a vertical line (y-axis). 3-8 The Pythagorean Theorem Warm Up Warm Up Lesson Presentation Lesson Presentation Problem of the Day Problem of the Day Lesson Quizzes Lesson Quizzes.